James Miller made a brilliant start from gate 4 and powered round the field to win in the second fastest time of the day 68.83 kept very honest by an inform Daniel Mckinlay. The racing just got better the weather didn't. Daniel Mckinlay got the same with 9 and 2 bonus points,showing true leadership quality team riding well. John Tuffley scored 8 and 1 bonus point and sets a high standard for his team mates to emulate well done that man. Jonathan Able weighed in with 6 hard earned points actually every point is hard earned in this competition. Glen Sole did too with 2 and 1 bonus and Aiden Thwaites 1 and 1 bonus. Well done to both teams the hardest core solo speedway supporters in the south Island witnessed a great meeting of fast paced solo action.Oh but it didn't stop there The second half of the meeting was enthrauling racing as well with The Matsons brewery Classic Series With Paul Fewings and Warwick Aldridge pushing each other hard and Simon Eastwick and Ian Graham getting smoother every outing. Every body that missed it really did miss out sorry. Cantabrian speedway team Ronnie's Rebels were surprised Saturday evening by a confident and assured Southland team racing at Oreti Park. Organiser of the Oval Racing Kiwi League speedway team racing series. Alan Crosbie said he was very pleased with the exciting racing and to see a large crowd of spectators enjoy the meeting in Invercargill. The Oreti Stormers also enjoyed the twilight meeting and were comfortable racing at their home track, proving that the Rebels' victory at Moore Park in October was not to be taken for granted. Racing in pairs to strategically earn points through the Invercargill meeting, the Stormers dominated to end the day with 42 points,6 points ahead of the Rebels on 36 the same result as the first match in reverse. James Miller and John Tuffley, recent winner of the Australasian Longtrack, both raced hard and fast for the Stormers and were well supported by their team-mates. Racing for the Rebels, the McKinlay brothers Blair and Daniel proved once again to be a force to be reckoned with, achieving strong wins in several races. The Rebels certainly worked well together, with a fine display of team work as they paired up to block opponents. However, the Stormers accumulated enough points through the meeting to emerge the victors. The two teams have now drawn level, with a victory each,and will be looking forward to seeing the third team in the series, the Tasman Tigers from Westport, race at Oreti Park on November 27. Rebels Team manager James Moore also said it is great to see the reason we started this series is already happening the guys are getting right into it and it is reflecting in the racing they are enjoying real hard and fast racing and developing a lot more confidence in their fellow competitors,and are concentrating more on riding hard and trying to stay on in rather tricky conditions than trying to hard to soon as their confedence grows the faster they will all go,defenitly a good grounding for them to elevate their skills we are already getting very close safe racing which is very pleasing.Another good thing comming out of all of this is the comradierie between the team members and between the teams is very positive which can only be a good thing. Southland turned on a fantastic day weather wise but unfortunatly near the end of the programm there was a downfall which gave the track a greasy surface and caused a delay with a sidecar incident which caused injury to Rider Graham Hewitson (Meat Ball) but considering conditions the riders were not phased ,they showed their skills to give the spectators a primo ending to the days racing in the final three heats which saw the final where the Mckinlay Brothers riding bar to bar for a breath taking four laps hard out on a diobolical surface. We also saw Retired Sidecar rider and Australaisian Ledgend Bruce Turner who just flew in from Australia where he lives now and held many Oueensland Northern territory and Australian best pair Championships and also Four times New Zealand Champion gave us a dislpay with a first time passenger who comes from Southland Aron Walton.Bruce's looking at selling his side chair while here over the season so if you would like to own a three wheeled rocket ship see Bruce beat ten grand out of the piggy bank and he'll even show you how to hammer it. Mark Skilling as Captain, Along with Sean Cox As Vice Captain,Mike Robinson,Denny Hayward,Jimmy Prendegast ,, Kenny Williams and Dean Mason. So far with the very successfull first Match at Moore Park Canterbury on the 13th of october and this one in Southland it has showen in this short time that the team competition is so valuable in bringing the best in solo Speedway Competition and heading to produce future Champions . The numbers tell the story folks well not quite Wayne Nutteriges score didn't reflect what he actually did out there on a bike sponsored by Ronder Mckinlay South Island Solo Spares and Promoter of the Kiwi League Alan Crosbie he made a big impression on the Rebels Team Manager James Moore who had not seen him on a solo before after 8 years out of the saddle and going the other way with another wheel on Side Chairs Wayne looked right at home soon as the tapes went up just has to remember these ones don't hold themselves up with pit bull like aggression fast and stylish with a few more outings it wouldn't be long before Wayne would be snaping at the heals of the top guys if not making them chase him only got a point for his efforts but they were much appretiated same as Scott Reed who came in to the Rebels line up along with Barry O'Brian a good experiance for both of them with Scott scoring 3 from 3 rides unlucky not to get a few more and looking smoother and building in confedence with every outing against a very good reserve pairing in Jeff Manson and Peter Stenning both scoring solidly in both matches the whole Stormers team scoring well led by James Miller 9 and a bonus unfortunatley I think James lunched his engine in his last ride its been going pretty good too unfortunatley they usually do go there best just before they do something like that.John Tuffley the new Australasian Long Track Champion a solid days effort dicing with Blair and Daniel all day already mentioned Peter Stenning but 8 from the reserve beth is a very good effort Alex Andrew and Aiden all scoring and good to see the bonus points for the stormers very good well done.The Rebels well that Blair Mckinlay must like that Mr Maximum tag because he went and did it again Daniel only droped one to James Miller But my ride of the match award would have to be Daniel's heat 12 victory after being shut out by a very fast starting James Miller and John Tuffley settling into a good team riding formation after a couple of real quick laps wish we had somebody with a stop watch out there Daniel effectivley splitting James and John and finding that extra little bit of drive to power between them for the win,ride of the day probley the second half final When Daniel and Blair did the fast siamese twin thing in the mud in the rain.Steve and Grant getting a hand full each and Scott got some too just seven elusive points missing,oh well thats tied it up till the next time we meet. Leading up to the event the weather was not looking good, rain and bad winds, but we were blessed again with it clearing during the day and even requiring us to water . And with the performance they turned on they definitely didn’t disgrace themselves and went home with extreme anticipation for their home Match in Westport on Saturday 4th of December against the Southland Stormers. Getting the show underway the colourful display by the Southland League Girls fired it into explosive action . Heat one was slightly spread but still showed an aggressive display, and the new Captain for the Tigers showed that he was going to lead the team by example with his fight back attitude but got taken by Alex Cunningham and came in third and Stormers Vice Captain and Number 1.James Miller took the 3 points by finishing in first place . 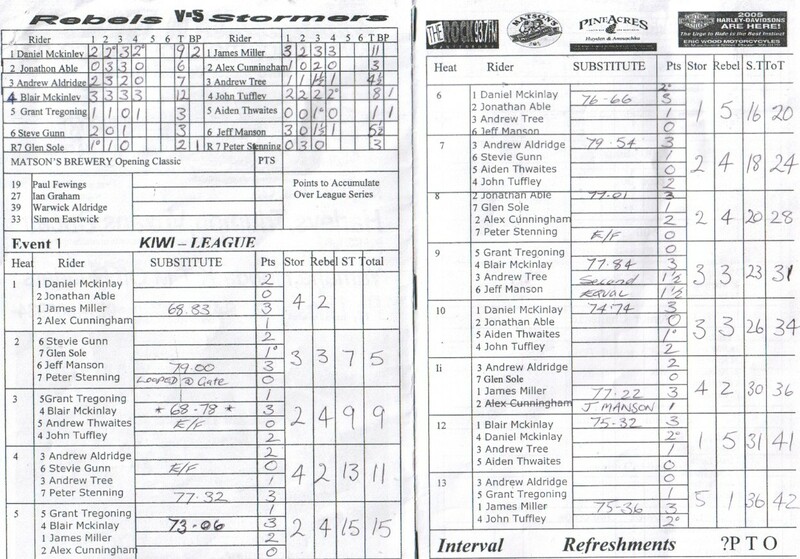 Things settled down from here on in to finish the score with a 28 point differance at 52/26 to The Southland Stormers but no can one say that the Stormers got it easy they had to work hard ,the front runners were very close so with a we bit of tuning and more experience the West Coast Tigers are going to be a threat to be recond with when they take on the Stormers on there home track next Saturday it is going to be an exciting out come to wait for any one add to that e-mail jtthmoore@hotmail.com any pickys. Rain cancelled the next 2 meetings at West Ports Speedway. We tryed to have one at Nelson Speedway on the 11th of December 2004 but the track was in not very good shape which doesn't happen often I was assured by the locals so next time we might be able to show the fans the sort of racing that this competition produces.